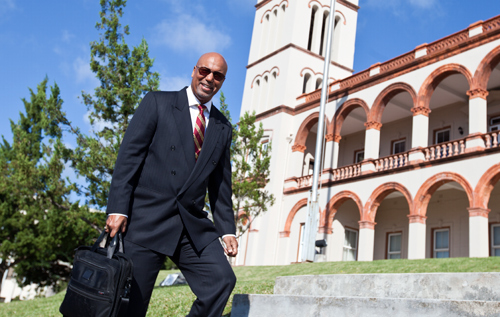 Bermuda is seeing a “fragile” economic recovery that could be “easily derailed”, Finance Minister ET (Bob) Richards said at the Chamber of Commerce’s Annual Budget Breakfast, sponsored by PwC Bermuda. In a panel moderated by PwC Bermuda CEO Darren Johnston, Mr Richards was joined by Peter Everson, the president and CEO of PEConsultants, and Ed Ball Jr, the Bermuda Public Services Union general secretary. Governor George Fergusson, Premier Craig Cannonier and US Consul General Robert Settje were among the 350 people in attendance. The panellists were asked by Mr Johnston to give their view of the Budget in a 140-character tweet. While Mr Everson said: “This Budget is about as good as it can be under these difficult circumstances. How well the senior management in the Civil Service perform will define the outcome." Minister Richards warned the Island’s financial independence “is at risk” if it doesn’t manage economic recovery well. Mr Ball agreed Bermuda must manage its fiscal responsibilities and it must also create employment of unemployed Bermudians. Questions from the COC membership ranged from - what is the timeline for privatisation and mutualisation, are we spending enough on Education and Tourism, should Bermuda drop all licence fees for PRC holders, what’s in the Budget for the average Bermudian to - has lowering Customs duties been considered. Mr Richards said he could not elaborate further on opportunities for outsourcing, privatising and mutualisation —as “it is still early days” and “it’s a complicated exercise that’s never been done before here”. “You have to go slowly, but you can’t go too slowly,” Mr Richards said. The Annual Budget Breakfast took place Monday morning at the Fairmont Hamilton Princess.